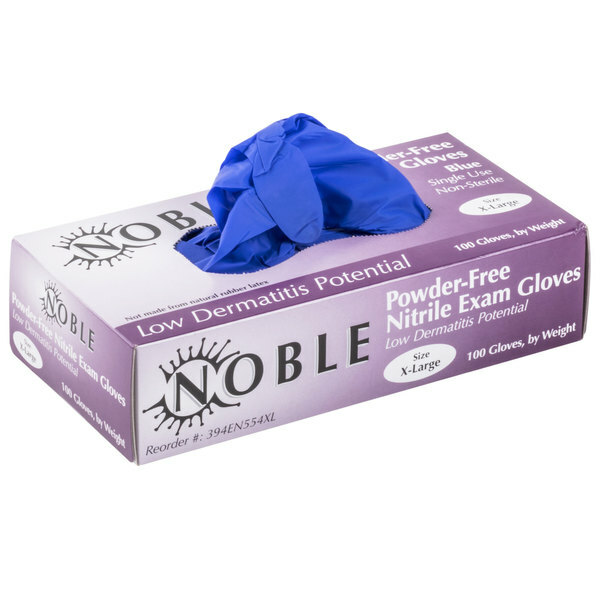 Cover all your bases with these multi-purpose Noble Products low dermatitis potential extra large nitrile gloves! 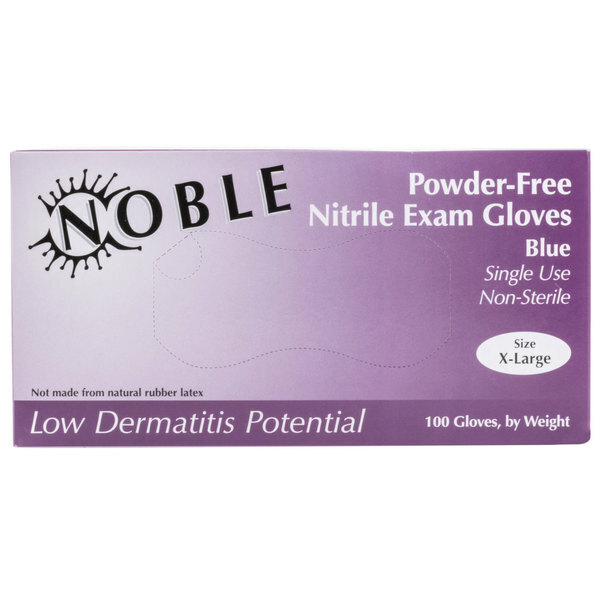 Noble Products low dermatitis potential 4 mil thick nitrile gloves provide exceptional puncture, tear, and chemical resistance. Thanks to a textured exterior, they also provide a firm grip in both wet and dry situations. They're ideal for food service operations, janitorial tasks, medical exams, dentist offices, nursing homes, veterinary clinics, and schools. "I purchased these for my handmade soap business and they are perfect. When making handmade soap it requires the use of sodium hydroxide and it is very caustic and will burn skin if not protected. These are great and fit well. I also use these when I bottle up sugar scrubs and lotion…"
These non-sterile nitrile 4 mil gloves are made with no accelerator chemicals, no latex proteins, and no added sulfur, which reduces the potential for Type IV allergic reactions to develop. This low dermatitis potential design is great for ensuring a comfortable, safe working environment for your employees without sacrificing the exceptional performance you expect from a nitrile glove. These versatile gloves form comfortably to your hands to offer the tactile sensitivity of comparable latex gloves. Plus, they also help reduce hand fatigue. Providing superior dexterity, they're great for food prep, machine maintenance, cleaning jobs, and a variety of other precision tasks. These gloves feature a bold blue-purple color, allowing you to designate them for specific tasks. The perforated box allows for easy and sanitary one-at-a-time glove dispensing. We like this Noble Products Nitrile 4 Mil Thick Low Dermatitis Textured Gloves - Extra Large, the price is really good, the material is amazing too, very resistant, It is perfect for many activities. These gloves are good and have a slightly longer wrist so if you are using your hands to mix things, it will create less mess on your skin. 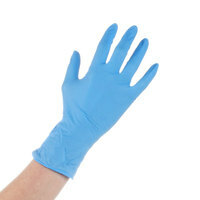 This Noble Nitrile glove fits well over a medium sized cut resistant glove, to prevent contamination when slicing meats. The rubber is flexible and comfortable to use. These dermatitis textured gloves are great for multipurpose use in the kitchen. They have a nice appearance and snug fit allowing you to handle food andd utensils properly. 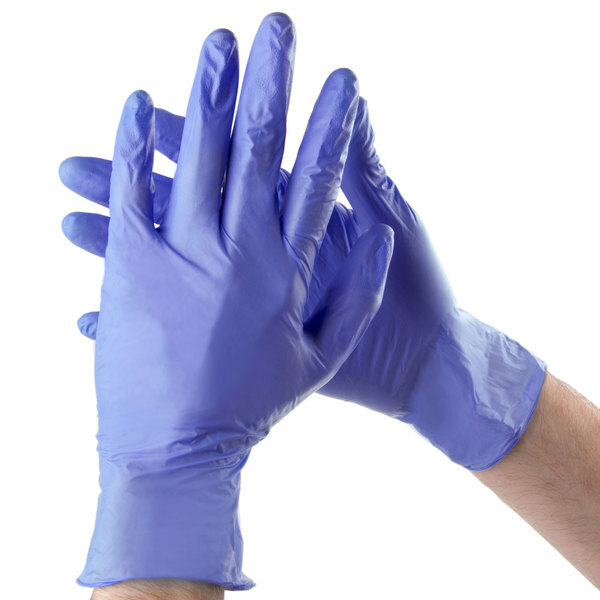 The Nitrile gloves are the best gloves to use around the kitchen. They are insanely durable, and have textured fingers for grip. Even if they are a little pricier than latex, they last longer and will save you money in the long run. These nitrile gloves from Noble are a nice comfortable fitting glove that will hold up to chemicals or long term cleaning tasks. Slight texture to the glove helps keep your grip if they get wet. These gloves are great on the hands are are strong! They are made of quality material so they do not puncture or rip easily when you put them on. The bold purple color of the gloves is fun! This probuct is great. It holds up to abuse and doesn't tear out. My only complaint is I would like to see this item in larger sizes. Another great value from webstraurant. Very strong and reasonably priced gloves. The best glove if you are handling and or preparing a lot of raw fatty meat. I like these gloves a lot. They make you feel like a high end mechanic. People who can see your chefs respond to them well too. I purchased these for my handmade soap business and they are perfect. When making handmade soap it requires the use of sodium hydroxide and it is very caustic and will burn skin if not protected. These are great and fit well. I also use these when I bottle up sugar scrubs and lotion to prevent cross contamination. These are not just for food use, all though I also use them to trim chicken and beef. I have big hands and these work well for me when I need a good glove. the price was also good so these are a win in my book. These are a real find. 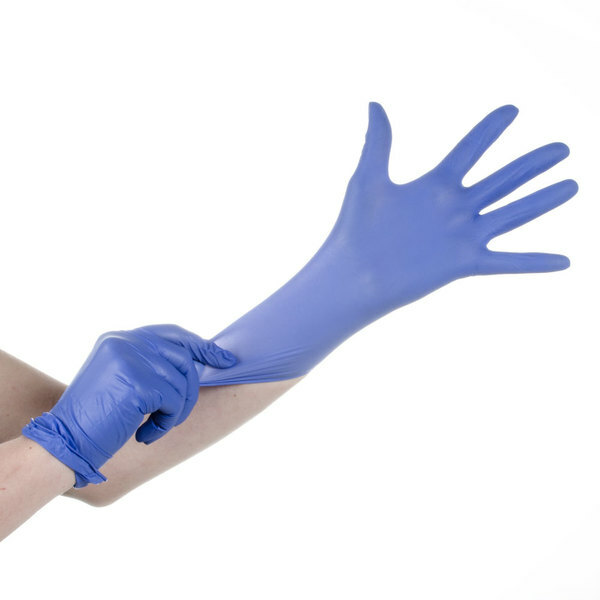 Nitrile gloves that actually fit! Who would have thought that they actually made them? Much better than the ones we bought at the store. I had an employee who wanted extra large gloves. These worked! An added benefit was we were using the typical clear gloves for everyone else so these stood out for ease of grabbing on the fly. These are decent gloves my minions enjoy using them, I had purchased XL as I'm a big guy but they did not fit me as well as other brands XL gloves.